Compliance with environmental regulations related to releases of hazardous materials, diesel fuel and other regulated substances can be a very demanding responsibility, especially if you operate multiple facilities and run trucks over the road. 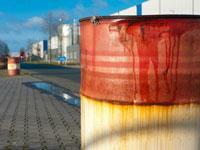 Accidents involving commercial vehicles commonly result in spills requiring cleanup and site remediation. They also involve mandatory reports to regulatory agencies to remain in compliance. After a spill requiring environmental cleanup, all activities, including efforts taken to contain and stop leaking materials and all regulatory reporting activities, should be logged in order to maintain a legally defensible position against third-party claimants. In truck-related incidents, drivers should write down everything they do after a spill to avoid being drawn into a pre-existing contamination problem as a responsible party, according to Spill Center President Tom Moses, who holds a Juris Doctorate degree and is a former U.S. EPA toxicologist. Spill Center has developed a highly sophisticated spill reporting and documentation program that is applied to the management of every incident that they handle for clients. The company maintains a database of current regulations for the thousands of federal, state, provincial and local jurisdictions throughout North America. Another database has up-to-date information on over 3,000 cleanup contractors qualified to handle environmental spills. Fines and penalties for non-compliance with reporting regulations vary from one jurisdiction to another, and the potential for multiple jurisdictions with separate reporting requirements exists in every incident. A spill in one of the five boroughs of New York City, for example, requires that reports be made to county, state and federal authorities – plus to the NYC Dept. of Environmental Protection. Failure to make the city report, can cost $25,000 a day, with each day being a separate violation. Nearly 30,000 federal, state/provincial and local jurisdictions across the U.S. and Canada require incident reports from spill generators. Keeping up with them is a daunting task. Plus, reportable quantities vary from jurisdiction to jurisdiction. When in doubt about whether a spill involves a reportable quantity, report it. Failure to file required reports can bring stiff fines and penalties, making it unwise to try to cover up a spill. The key to staying out of trouble with environmental authorities and avoiding fines is in knowing which reports you owe to whom after accidental releases of fuel, spent solvents, cleaning materials, toxic chemicals and other hazardous materials used in a typical fleet operation. Maintain current reporting requirements and contacts for every jurisdiction in which your equipment operates to protect yourself from fines for non-compliance with environmental reporting regulations. The Spill Center program was developed to help level the playing field for spill generators who are forced to deal with regulatory authorities, cleanup contractors and third-party claimants. Clients range from the largest truckload, LTL and private fleets, to small fleets, chemical, environmental and insurance companies and truck leasing companies. Spill Center has been helping carriers, shippers, truck leasing & rental companies, chemical companies and insurers contain costs and limit liability related to environmental spills since 1990. This information is provided by Spill Center®, a leading nationwide spill-support specialist and environmental claims management company. With more than 20 years experience assessing and managing environmental spills, Spill Center offers expertise in emergency response, investigation and remediation of accidental releases of hazmat and other regulated materials. A comprehensive program, which includes assistance with spill reporting and documentation of all actions taken on behalf of clients, is available to help them deal with environmental releases swiftly and thoroughly to avoid trouble with the authorities. To learn more about Spill Center spill support and environmental claims management services, visit www.spillcenter.com; call Tom Moses directly at 978-568-1922, X222; or e-mail him at tmoses@spillcenter.com.